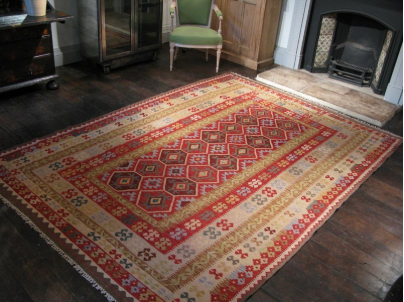 The rugs we sell both online and in store at West End Co. are durable and timeless in design. Here are some rug care and maintenance tips to help retain their integrity over time. Small particles and dirt and grit can work their way to the base of the rug and have an abrasive impact on the rug’s foundation. The suction attachment of a vacuum cleaner is the best tool for this as it doesn’t damage the pile. You are best advised to avoid using a beater brush. Beater brushes slowly remove a portion of a rug’s pile and will eventually destroy a rug. Quickly sponge up the liquid with a plain coloured sponge and soda water if required. You are best advised to avoid using cleaning agents, as they may have an impact on the dyes and forever damage your rug. For darker rugs, you may want to let certain foods dry on the rug before removing them. Just remember to let wet patches of the rug dry well before placing back on the floor. Apart from the unpleasant odour, pet urine is very damaging to a rug causing permanent staining and dry rot. Again, use soda water and a plainly coloured cloth to sponge up area. If lightly coloured, you may want to speak to a professional rug cleaner. Moth damage most frequently occurs when a rug is placed under furniture. Try to lift furniture off rugs and vacuum the area regularly.